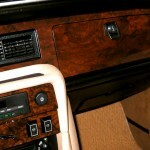 Among the types of woodwork we do are specialty restorations and new fabrications for automotive application. We have refurbished dashboards and interior trim for many British cars including, MG’s, Triumphs, Sunbeams, Rovers, Jaguars, Bentleys and Rolls Royces. Our American car customers have trusted us with everything from a 1931 Packard to mid-70’s muscle cars. The interior trim of several Mercedes Benz models have also come through our shop.